Where possible avoid placing complex implementation logic in here instead factor out into more focused feature specific classes inside the android_webview/browser folder or as a component in the top-level components/ folder (e.g. if needs to be shared with Chrome browser). By convention code in here should follow the same threading model as the public WebView API (that is, primarily executes on UI thread). Non-trivial interaction with BrowserThreads and IPC to renderer is extracted down to the browser/ folder. Provides non-trivial behavioral and functional classes for implementing features not directly exported by the content module public API. By convention, any complex native threading code should be encapsulated here. DEPS enforces that classes in this folder have no static dependency on the higher layer android_webview/native JNI wrappers. This aims to make the pieces in browser/ more modular and testable, and minimize the big ball of mud tendency. Contains all code that logically resides in the renderer process. 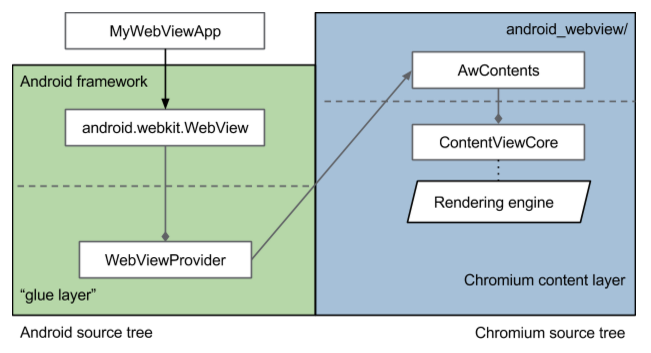 While WebView currently only supports single process mode, the browser/renderer separation is maintained as it is a useful architectural separation between the (implicitly trusted) java application and the (potentially untrusted) web-platform code. This is the main entry point to the libwebviewchromium.so native library. This is the top of the native code static dependency tree; no other module may depend on this. While single process mode makes it possible to share state via e.g. globals hidden in this module, resist this temptation. Instead common abstract types may be declared here, but the concrete instances should be constructed and passed in from the appropriate creational class in android_webview/lib. As per chromium conventions, IPC message types are declared here. Defines and exports abstract native interfaces for certain performance critical (e.g. rendering pipeline) functionality and that cannot be implemented via Java. This resolves the conflicting needs: of keeping all chromium code SDK/NDK clean, yet using certain internal Android platform facilities to implement a backwards compatible and high-performance framework custom View class. To minimize ABI interdependencies (e.g. avoid STL types being passed over .so boundary, incompatible new/delete calls across boundaries, etc) the interfaces declared here use simple C-style calling conventions (POD structs and static methods, injected via tables of simple function pointer). The plat_support module in frameworks/webview provides the canonical concrete realization of the abstract interfaces declared here. Integration tests for the org.chromium.android_webview. * APIs. They do however have access to internal APIs and state that is unavailable further up the stack. Unit tests for functionality implemented entirely in Java (for example AwLayoutSizerTest.java). Unit tests extend InstrumentationTestCase. Java support code for C++ unittests. This is necessary to test any code that uses JNI, for example any logic checked into the android_webview/native layer. Declares the [hidden] abstract WebViewFactoryProvider, WebViewProvider interface that webview implementations must subclass. The goal is this should only depend on android_webview public APIs (some accidental exceptions exist, e.g. ThreadUtils, LibraryLoader etc) and not contain complex logic; just method forwarding (interface adaption) across the boundary. provides a native support library to bind a select few internal native platform APIs to android_webview/public counterparts (e.g. GL functor, gralloc, and skia bitmap access utilities). Dependency injection of code in this folder avoids any build-time dependency of external/chromium_org on non-NDK symbols. Android Compatibility Test Suite for the android.webkit. * APIs. These tests have only access to the ‘public’ WebView API and test the WebView implementation in an configuration identical to when it’s actually running in an application. There should be at least one test for every publicly exposed API in the suite. This makes sure everything is ‘hooked up’ correctly.